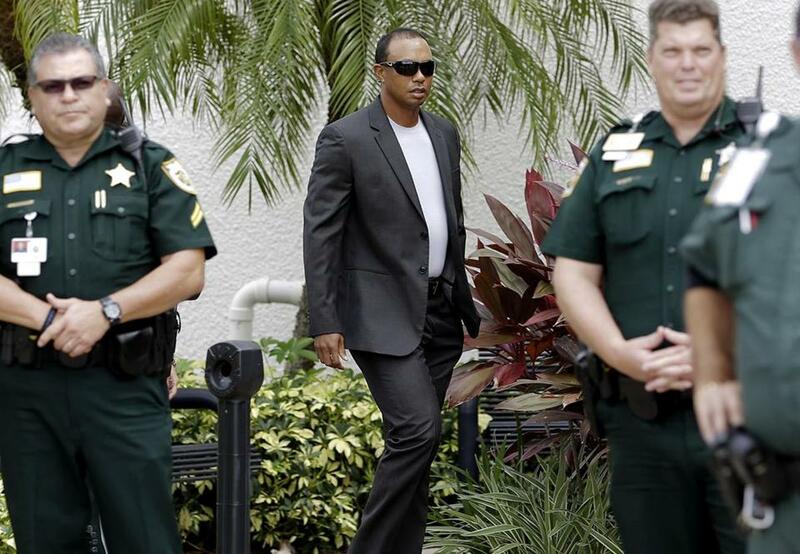 Tiger Woods arrives at the Palm Beach County courthouse, surrounded by police. PALM BEACH GARDENS, Fla. — Golf star Tiger Woods pleaded guilty to reckless driving Friday and agreed to enter a diversion program, five months after he was found passed out in his Mercedes with prescription drugs and marijuana in his system. Woods, 41, spoke only briefly during a hearing at a Palm Beach County courthouse, answering questions from a judge about his plea agreement. Prosecutors dropped his driving under the influence charge, and the judge warned him to stay out of trouble. ‘‘This particular plea agreement has no jail time on it,” Judge Sandra Bosso-Pardo said. “However, if you violate your probation in any significant way, I could revoke your probation and then I could sentence you to jail for 90 days with a fine of up to $500. Is that understood?’’ . In the diversion program, Woods will spend a year on probation and pay a $250 fine and court costs. He has already met some of the program’s other requirements, completing 50 hours of community service at the Tiger Woods Foundation, prosecutor Dave Aronberg said. Woods had the active ingredient for marijuana, two painkillers — Vicodin and Dilaudid — the sleep drug Ambien, and the anti-anxiety drug Xanax in his system but no alcohol, according to a toxicology report released in August. He completed a drug treatment program in July. The DUI arrest was the first time Woods had been in trouble since Thanksgiving weekend 2009, when he plowed his SUV into a tree and a fire hydrant outside his then-home in Windermere, Fla. That led to revelations that he had multiple extramarital affairs and a divorce from his wife Elin Nordegren, the mother of his two children. He spent 45 days in a Mississippi clinic, where he was treated for an addiction. Woods’s 79 PGA Tour victories and 14 major titles both rank No. 2 all-time. He has not competed since February because of his back injury and is not expected to return this year. His last win was in August 2013. Woods has said his back is improving. Even though he has been a nonfactor on the PGA Tour, Forbes Magazine lists Woods as the 17th best-paid athlete in the world in 2017, making $37 million, almost exclusively from endorsements.